This book is based on the TRIPLE i in Suicidology international conferences, which are organised annually by the Slovene Centre for Suicide Research in memory of the late Prof. Andrej Marušic with the aim of promoting intuition, imagination, and innovation in the research and prevention of suicide and suicidal behaviour. The carefully selected chapters provide food for thought to practitioners, researchers, students, and all those who come into contact with the tragedy of suicide, with the hope of stimulating new ideas and interventions in the difficult fight against suicidal behaviours. In four parts, the internationally renowned team of authors summarise the achievements of suicidology so far (both in quantitative and qualitative research), present effective interventions in suicide prevention (including for youths and older people) and knowledge gained in bereavement and postvention studies (such as in different cultures and those bereaved by suicide), and highlight future directions for suicide research and prevention. The volume is thus a useful resource for all those interested in keeping up-to-date with recent research and practice in suicide. 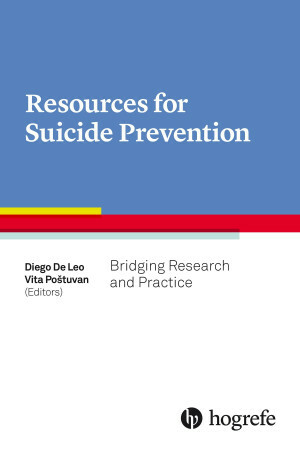 "[A] valuable and comprehensive resource for those wanting to better understand the multidimensional components of suicide and strategies for its prevention. This book contains an abundance of information and spans a wide variety of topics, [...] presented in a concise, well-organized format and will likely serve as an important resource for both researchers and practitioners alike." "The work is of excellent quality [and] provides a lot of interesting and instructive aspects, which can be of great interest for the research of suicide and practice of suicide prevention [...]." "The volume “Resources for suicide prevention” presents a concise introduction to the contemporary research and practice of suicide prevention.It is praiseworthy that the third section on postvention includes three chapters highlighting the need for cross-cultural perspectives on suicide bereavement and the importance of evidence from both quantitative and qualitative studies regarding characteristics of suicide bereavement and effectiveness of support for the bereaved. The volume highlights contemporary issues in suicidology, and presents thought-provoking material for practitioners, researchers, students, and anyone who hasa genuine interest in suicide prevention." "[A]n unexpectedly thought-provoking read on a vital topic. It clearly illustrates the need for further research in this field, yet covers the large amount of information that is currently available in a format that enables application in clinical practice. [W]hile anyone interested in the topic of suicide could benefit from this book, clinicians dealing directly with patients and their loved ones battling suicidal thoughts, gestures, and attempts would get the most from reading it."